Growing one plant from seed until harvest is already tough work, but Bushgrower dared to venture into cultivating eleven marijuana plants at the same time. Two of these seeds came from ILGM: one is Golf Leaf and another is Super Skunk. Fully aware that growing these plants, especially for the first time, can be strenuous, he started a grow journal in ILGM forums. It aided in the interaction of veteran and rookie growers like Bushgrower himself. Other cultivators were able to share their experiences which helped see this grow through. Indica strains are best known to relieve conditions connected with the body. Even with such little information, a lot of people favor smoking Gold Leaf for its ability to provide a reprieve from fatigue, insomnia, pain or even stress. Another indica dominant favorite is Super Skunk. Like Gold Leaf, it relaxes the body of stress and body pains. This strain is known to be a bearer of pungent smell with a sweet taste while the Gold Leaf is earthy all throughout. Eleven sprouts are now growing inside Bushgrower’s space: one ILGM Gold Leaf, one ILGM Super Skunk and the rest are random seeds from other people. The oldest one is about three weeks into vegetation, while the ILGM sprouts are the youngest and are estimated to be at least a week old. Bat Guano: Recommended dosage is 10mL per liter, but since these are relatively young plants, he is giving five mL per liter instead. Eleven plants in this 4’ x 4’ x 10’ tent can get a little crowded. A sound suggestion as a slight breeze also strengthens the stems while increasing air circulation. Even after placing a fan inside the tent, one of the plants still refused to grow. It has stayed this way for a couple of weeks already, yet no changes occurred. Bushgrower thinks maybe the root system of this particular plant has not fully developed. Other growers worry that this rookie grower is overwatering. He gives the plants water after seeing the top layer of the soil dried up, but not underneath. For now, he has made up his mind to ease with watering and even pay attention to the weight of the plants. As for the other plants, Bushgrower topped the biggest one four days ago. Since then, it has grown to be a bushy plant. Another plant brings concern because the fan blows on it directly causing damage to its leaves. The tallest plant, now known as “High Hopes”, has a string around the main stalk after undergoing low-stress training (LST). This is the second procedure done as Bushgrower topped it almost a week ago. A week has passed since Bushgrower started this grow journal for the eleven plants he is growing. High Hopes is still recognizable as she is the only one that went under LST and is still the tallest of them all. However, the plant that seems to have stopped growing barely has any growth to show. Initial culprit when its growth slowed down was overwatering. Since then, the watering system has changed and he has learned how to get a good run off while measuring the before and after weight of the pots and plants. The run off measures at around pH 8. To lower it down, Bushgrower fills his 5L watering can with water and slowly adds fresh lemon juice until it reaches pH 5. When it has settled in the soil that is the only time to add Super Grow Liquid concentrate which serves as his fertilizer. This is a solution that is good for only a short time and still needs pH up/down to balance the pH in the soil. Plants are responding well to the new watering method that Bushgrower applied. ILGM’s Gold Leaf, in particular, showed amazing growth. In a week, its height went from 8.5 centimeters to 13 centimeters. The smallest plant is a rare case in the tent. Aside from a couple of leaves, no other improvements can be seen. It is distinctly smaller than the rest of the batch and the height has not changed for over two weeks already. The novice grower is now contemplating whether to pull it out or leave it as is. Experienced growers advised against pulling it out. There are still some new leaf growths and the stalk is thick, the only problem is her height. A fellow grower from ILGM suggested re-potting in milder soil for better control over the nutrients. He sees the organic soil being a little hot and nutrient-rich that this particular strain cannot handle. Hammer, another grower, still sees some signs of overwatering. He recommended adding two teaspoons of household hydrogen peroxide per gallon of water to remedy. Hydrogen Peroxide, in simpler terms, is water with an additional oxygen atom. By adding it to water, it naturally aerates the soil and could also pave the way for stronger root formation. The hydrogen suggestion did not pull through. Instead, Rootblast was added to promote stronger and bigger root formation. Oak’s repotting suggestion actually happened, only it’s not on the smallest plant. Bushgrower repotted the biggest plant into a 4-gallon one. Since there are some extra pots lying around, nine more plants were re-potted as well. Rouge, the smallest plant, did not make it. As Bushgrower was preparing to transplant her, he noticed that its roots were barely 3 centimeters long. The final decision was to pull it out. A week since the replanting and the girls’ give the tent an alluring aroma. Bushgrower thinks this is a sign of pre-flowering and planned to flip in 11 days. In preparation, a 600-watts HPS lamp replaces the 400-watts MH lamp that used to be in the tent. High Hopes is the first one to show signs of pre-flowering. Skinny white hairs are starting to appear on her. A theory rose among the growers early on that plants that grow fast turn out to be male. It scared him and decided not to repot this one. Bushgrower also regretted not repotting her into a bigger pot now that she has hairs. Genders of the other plants are also starting to show. One plant grew some pollen sacs, a male plant’s reproductive organ. Bushgrower pulled it out of the tent immediately. Only four days to go until flowering and there are still some things done to prepare the plants. Aside from some LST, lollipopping is on today’s agenda. This process is the removal of lower branches to improve airflow, keep the plant in shape and direct energy where it is needed. The name comes from the way the plants look after the process, as it resembles the sweet treat. What started out as eleven plants grow, only now has seven as two more plants turned out to be males. However, both ILGM Gold Leaf and Super Skunk are still in the game. Bushgrower is also worried since flowering often induces more growth. With seven plants, he is not sure whether a new room is in order since they may outgrow the tent soon. Ladies already finished their first 12-12 cycle today. Just in time because their grower also finished their ScrOG (Screen of Green) net today. Now that the plants are actually in flowering, it is easy to see that the tent is not enough. Bushgrower spent a good four hours setting up the room while ensuring that it is lightproof, packing up the tent and moving all seven plants in the tent. Other growers commend the new grow room. However, all of them have the same concern: the lighting. Maximizing it should be the next thing that Bushgrower tackles as there is not enough. Fellowe grower Paranorman suggested turning the cooling tube light in such a way that it is positioned from back to front and not the way it is as of now. Once settled, he listened and added another 600-watt bulb. Since the plants started flowering, Bushgrower gives them LST consistently every night. This method actually helped improve the shape of the plants and should maximize the yield. Taking another step to increasing yield, the ecstatic grower added another cooling tube in the grow room. Aside from increasing lights, the tube also lowers temperature in the area since it started hitting 90°F. Nine days in flowering and the plants are definitely broader and taller than they used to be. Bushgrower estimates that while they may not be able to fill the whole grow room after all. While all is working out fine, Bushgrower noticed some yellowing of the leaves coming from the bigger plants. The saying “When it rains, it pours” is hitting Bushgrower hard as of today. 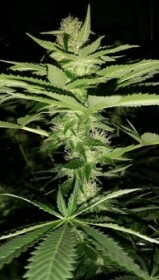 After discovering the deficiency in the bigger plants, pollen sacs and pistils started appearing on one of the plants. This is a clear sign of a hermaphrodite or better known as a “hermie”. Now that it is out of the tent, it certainly leaves a big space in the grow room. Plants remaining in the room are already starting to bud up. This one, christened with the name ‘Thunder’, is the one with the most buds now that all plants are flowering for barely two weeks. The others are thriving as well but this Bushgrower’s favorite so far. Almost a month in flowering and the buds continue to pack up their weight. Although, at this point, no amber hairs can be seen yet. An earthy smell is starting to take over the grow room and it is coming from ILGM’s Gold Leaf. Dwarf and High Hopes are affected with some kind of deficiency and are fox tailing at the tips of the colas. With no solution in mind, Bushgrower decided to change the schedule to 10/14. Now that the buds are maturing, amber hairs are starting to appear. Pistils on the Gold Leaf are nearing the peak of their maturity. As a matter of fact, the majority are already amber in color. Now the grower is wondering whether or not this is the perfect time to harvest. Ideally, if relying on the pistils instead of the trichomes, the amber hairs tell its readiness to harvest. Sadly, the landlady announced an inspection around the apartment Bushgrower is in. Left with no choice, all plants were harvested early. With the seven plants, his yield is over 16 ounces. Losses are part of the game. May it be marijuana plants turning out to be males, stunted growth or any other reasons teach growers lessons and gives them ideas on how to improve. Be prepared when it comes to spaces. No one can determine the height a plant would grow. It is somewhat safe to prepare a big area especially when trying to cultivate marijuana plants, rather than to keep moving each time the expanse is not enough.